The Sixers' Joel Embiid lands on Boston's Kyrie Irving during the first quarter at the Wells Fargo Center on Wednesday night. 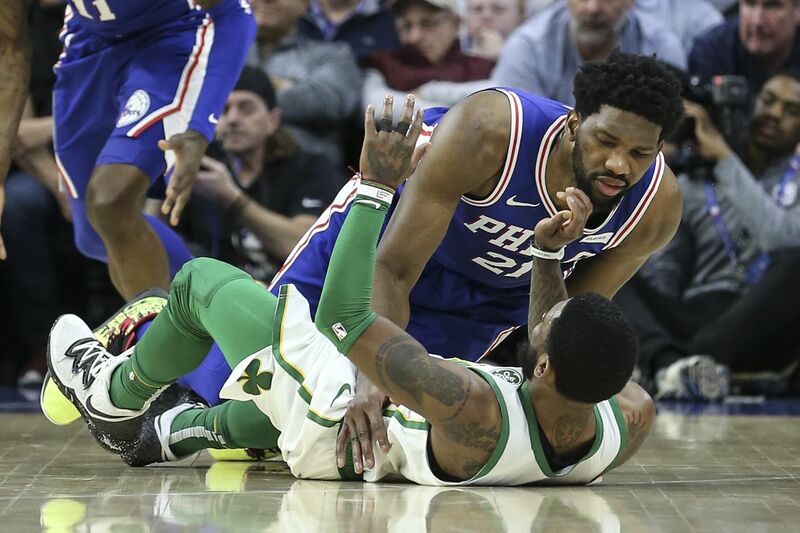 In the latest Locked on Sixers podcast, Keith Pompey, the Boston Globe’s Gary Washburn, and the Athletics’ Michael Lee ponder if Wednesday’s 76ers vs Boston Celtics game was a preview of the Eastern Conference finals. They also give their opinions about which team has more to lose from a first-round exit. And they name a player from the Sixers’ and Celtics’ rosters they’re intrigued to see in the postseason.